San Mateo – March 1, 2018 – Today, Morpheus Data announced major sales incentives available immediately to new and existing channel partners. 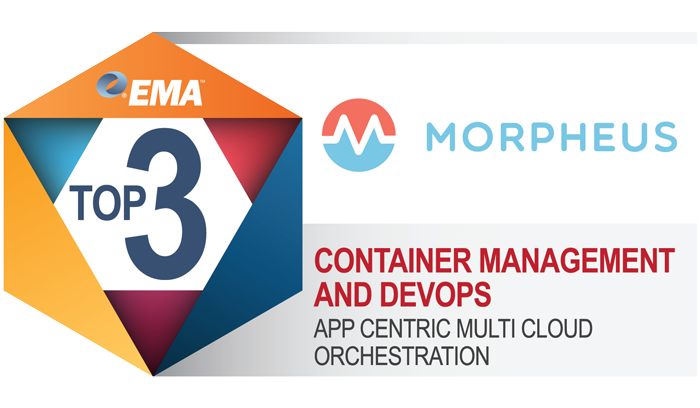 In addition, Morpheus Data was named a Top3 provider in today’s Enterprise Management Associates’ (EMA) report on container management and DevOps validating alignment with enterprise needs. Morpheus is addressing the multi-billion-dollar markets of cloud cost optimization, cloud management, and DevOps automation; this combined opportunity is growing at close to 20% CAGR, providing channel partners with tremendous business opportunity. With over 200% year over year revenue growth in the last 24 months and more 7-figure deals in the last quarter than ever before, Morpheus is enhancing its partner program and accelerating partner enablement. As a 100% channel-first company, Morpheus Data strengthens its commitment and confidence to providing strong business opportunity to its partners. Nicknamed “the Big Spiff”, the company is adding a $250,000 back-end cash rebate on top of already lucrative plans for gold-tier channel partners which drive at least $2.5M in revenue in the next 6 months. This promotion should help channel leaders drive the organizational transition and incremental focus on Cloud/Software sales as traditional hardware business continues to erode. Full program details are available to Morpheus partners but a recent social post highlights the opportunity for those who have embraced the CloudOps and DevOps revolution. In addition to financial incentives, the company recently rolled out its Morpheus Verified Professional (MVP) program with the certification of two-dozen new solution providers. Morpheus also cemented a strategic resale relationship with Dell Technologies in EMEA, added major EMEA reseller ComputaCenter to its ranks, and expanded channel co-selling resources in 6 new sales territories strengthening its global momentum. The ranking was published in EMA’s decision guide “Ten Priorities for Container Management and DevOps in Production and at Scale in 2018“ and based on over 300 interviews of enterprise organizations focused on digital transformation with a specific focus on what it takes to manage containers and DevOps at scale. “As a container-native platform, which also includes support for Kubernetes and Docker Swarm, Morpheus was proud of the result and encouraged to see more customers aggressively shifting to next generation multi-cloud management,” says Brad Parks, VP of Business Development at Morpheus Data. “Modern cloud management products need to fully focus on automating and optimizing DevOps and application management processes. Enterprise Management Associates (EMA) named Morpheus an EMA Top 3 vendor due to the product’s ability to tie together the DevOps toolchain, IT operations solutions, and private and public cloud resources,” says Torsten Volk, managing research director at EMA. Morpheus Data, LLC is the entity behind the Morpheus unified orchestration platform, the only enterprise software solution to bring together cloud optimization, multi-cloud management, and hybrid XaaS services. As a one-hundred percent infrastructure and platform agnostic solution, Morpheus provides IT Operations and Developers fully self-service and automated provisioning of bare metal, VM, and containerized applications running on-premises or in the public cloud. Unlike first generation CMP platforms or platform specific automation tools, Morpheus can speed up application delivery, simplify workload migration, eliminate cloud lock-in, and simplify management of heterogeneous environments. From day 0 development tools to day 2 operations Morpheus offers more built-in integrations and native functionality than any other platform, giving customers the ability to standardize workflows and reduce tool sprawl while orchestrating existing tools to provide investment protection.